The idea that there can be multiple sources of evil is an interesting one. Some exorcists, such as Malachi Martin and Gabriele Amorth, have said that Lucifer and Satan are separate entities. In this view, Lucifer is the original fallen angel, the light-bringer, whose nature fell through pride and envy, and Satan is considered among the third of the angels in heaven who followed Lucifer and embodies death and destruction, the dragon of Revelation who fought Michael and his angels. Perhaps this is why the Bible makes a distinction between the “spirits of wickedness in the heavenly places” (Ephesians 6:12) and the “beast, that ascendeth out of the abyss” (Revelation 11:17). Following this categorization, R’hllor could be considered a Luciferian being, giving the false appearance of light and divinity, while the Great Other embodies a satanic nature of chaos and annihilation. In Westeros, this false dualism attracts followers to one demon, out of fear for the other. But, this won’t be an in-depth analysis of the larger metaphysical scheme we see in Game of Thrones, but rather an analysis of some of the archetypes that a very popular character, Daenerys Targaryen, touches on. Her character starts off as a timid and submissive to her brother Viserys, who is a bit of a violent sociopath, prone to mood swings and jealousy. 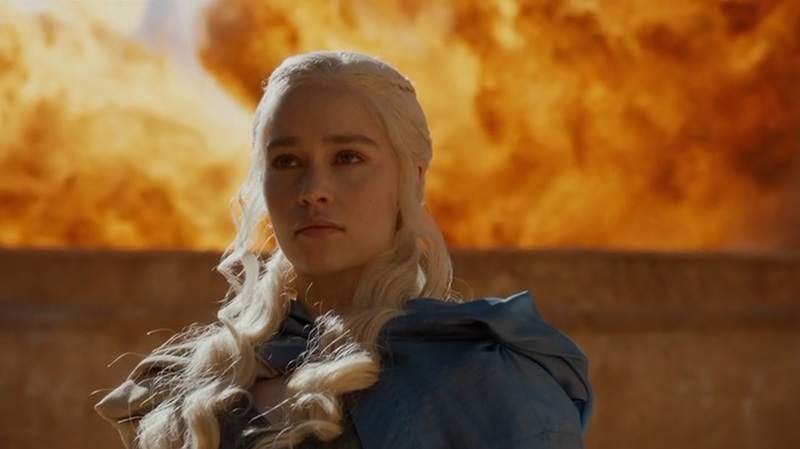 Ever since she got shacked up with Khal Drogo, something changed, and become a strong, independent and courageous chick who would adopt 3 baby dragons as she stands naked and triumphant in the morning light, when she emerges out of the ashes of a funeral pyre. And all of this would serve as a precedent for where she is now in the books and in the show. Also notice that the dragons in the show and the books aren’t depicted as any force for evil but as a force of nature and intelligent “fire made flesh.” They just are. Her character has a strong resemblance to three different figures in Christian and Gnostic lore. These include Saint Catherine of Alexandria, Hypatia, and Norea from Sethian Gnostic literature. Now let’s get started shall we? 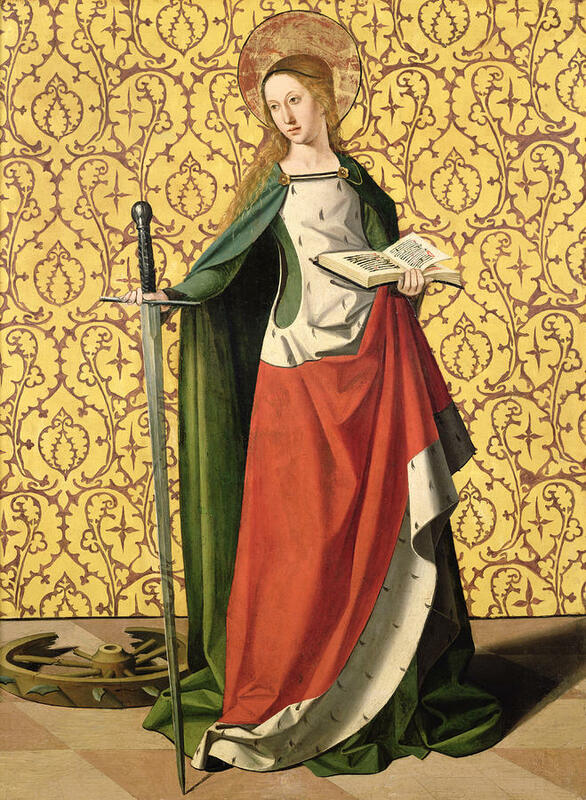 Because of the long gap between the time of her martyrdom and the first written testimony, many scholars and authorities have concluded that St. Catherine never existed, such as the Vatican did in 1969 (though she was restored in 2002). Some have even postulated that her story is an allegory, like many scenes from the lives of various saints, such as the story of St. Christopher (Christ-bearer) who is said to have carried the infant Jesus on his shoulder, or the story of St. George who is said to have slain a dragon to save a princess. And it all stands with good reason. Interestingly, the original Greek form of the name Αικατερινη (Aikaterine) or Εκατερινη (Ekaterine) is etymologically very obscure and much argued over. The name does not seem to be rooted in any Greek word, although it has been said to derive from the words αει (aei) which means “ever” and καθαρος (katharos) which means “pure”. What we do know is that this name never appears before it is associated with Saint Catherine of Alexandria. 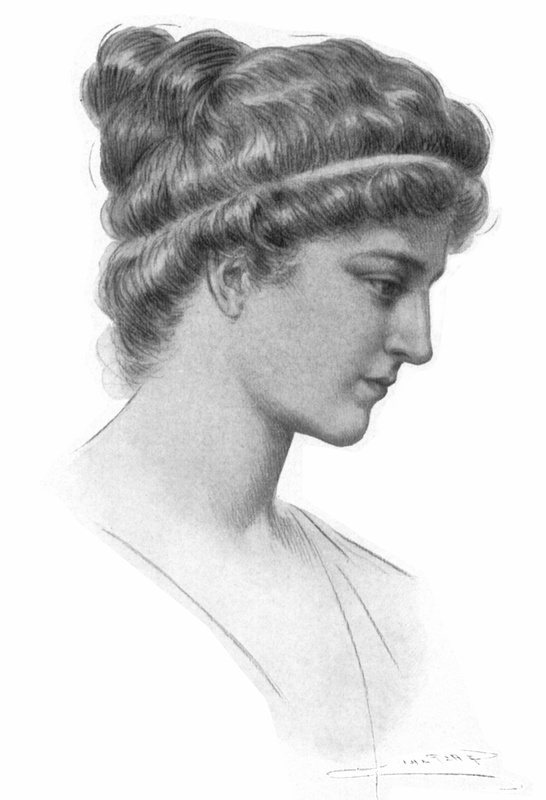 One of the more interesting theories is that the story of St. Catherine is based on the life of Hypatia, a Neoplatonist philosopher from Alexandria who was admired by both pagans and Christians for her virtue and learning. She also was a woman who dedicated her life to virginity in Alexandria for the sake of her learning, and was brutally murdered in 415 by a group of Christian monks primarily for political reasons. It is not difficult to see the parallels between the lives of St. Catherine and Hypatia, for the little we know of both, they may be the same figure. However, a case can be made that they are indeed two different persons. We can also see that also St. Catherine represents an aspect of the Divine Mother, who both in the Western and in the Eastern Gnosis has two modes, called by the Indians Avidyâ Mâyâ (Mâyâ of ignorance) and Vidyâ Mâyâ (Mâyâ of Knowledge, that is Gnosis or Jnâna) respectively. The first one (Mary) carries the divine Spark down to the natural world; the second one (St. Catherine) takes the Spark, made free from the schêma (samsâra), upwards to God. This schema is symbolized as the wheel that Saint Catherine and Daenerys Targaryen seek to break. That is why “Mary” finds herself on the left side, on the descending arc, while “St. Catherine” (Greek katharà, “pure”, wherefore the white garment next to her) is on the ascending arc. Her sword is the one that cuts the bonds keeping the Soul chained to the wheel of the samsâra. In fact, according to the legend, St. Catherine freed herself from the wheel to which she had been bound. And we know that, Gnostically viewed, the Resurrection is the liberation from that wheel. It is therefore clear that the circular movement in the picture represents the whole cycle of the Soul’s history, from the “fall” into the deadly (coffin) samsâra to the final liberation therefrom. The sacrificial blood of the Savior descends from the Ecce Homo (Anthropos) in parallel with the Pneumatic Seed plunging into the Psychic Waters. This means that the divine compassion accompanies the soul in her descent. Projecting Himself into the temporal order the Savior (the Antaryâmin, the “Inner Ruler” of the Hindu Gnosis) remains united with the Soul in all her vicissitudes, suffering with her, saving her, again with her ascending to God. It is this Presence of the Inner Savior in the Soul that promises, makes possible, and ensures the actuation in the Soul of the eternal Plan of Salvation. The “blood” of the divine Sacrifice descends to impart eternal Life (Aiônios Zöê), while the burden of all kind of suffering is taken up by the Crucified One, and here is the spunge full of a bitter liquid carried upward by the reed which not by chance leaves the wheel of the samsâra to reach the Cross. But the reed, situated on the right side, parallel to St. Catherine, means also that the redeemed ones, the liberated Souls, are at one with the Christ also in the work of salvation: they too take upon themselves the suffering of all those that still wander in the world of Death. The Rest (“repose”) of the Pneumatics takes place in the Lord’s Day, in the Ogdoad (63,1). … the beginning of the eighth day, that is the beginning of a new world. Therefore we celebrate with joy the eighth day, when also Jesus rose from the dead…”. When one looks at the banner for the House Targaryen, one finds three red dragon heads. This likely invokes imagery of the dragon one finds in Revelation. But, there is deeper symbolism embedded in the banner as some think that the three heads represent the “Prince that was Promised,” or the “Lightbringer” that many characters in Game of Thrones of mentioned here and there. 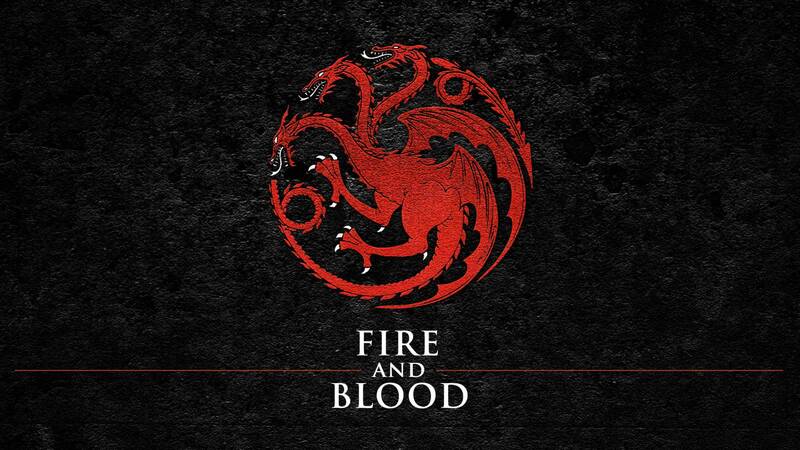 Fire and Blood is also symbolic for the baptism of fire mentioned in Luke by Jesus 12:489. This is certainly not arbitrary, for the three heads represent the three souls enveloping the divine Spark or Spirit in the Valentinian Gnosis: the Hylic or earthy (the dark color), the Psychic (red), and the Pneumatic soul (white). In the Excerpta we read in fact that the Pneumatics “wear their Souls as garments until the Completion” (63,1) and that “after laying them down … enter the Bridal Chamber within the Limit” (64). 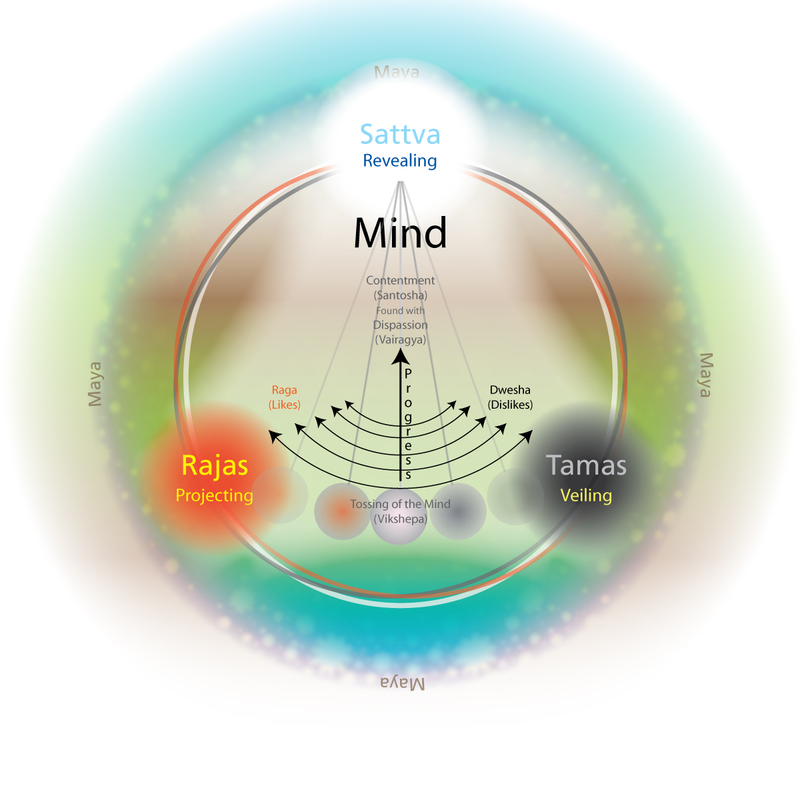 The three colors represent here the three modes of the “Woman” in Her manifestations: inertia-reaction-materiality (tamas, black), action-energy-passion (rajas, red), and harmony-equilibrium-spirituality (sattva, white). No wonder therefore that the Indian Gnosis is perfectly parallel with the Western one in the Bible and in the arch-heretics, in grouping the human beings in three classes: the Tamasic (Hylic), the Rajasic (Psychic) and the Sattvic (Pneumatic) ones. Please notice that in the picture the three colors follow the right order: materiality (raja) on the left, after the descent, and spirituality at the top, as the premise to the ascension. On a smaller scale, this is also the cycle of each individual life: the taking a body (black) at birth on the left, then the lifespan as the raja (red) and finally the death (white) on the top. Finally, there is also Norea. Norea appears in a few texts found in the Nag Hammadi Codices. Norea in Aramaic means “fiery.” Some think that Norea is related to Naamah as the wife of Noah and sometimes the sister of Tubal-Cain. In Jewish Kabbalistic legends, we see that Naamah is a bit of a naughty girl since she walks about stark naked all over the place and this inflames the lusts of the angels. Because of her striking beauty, Naamah was able to seduce the angels Shemyaza and Azazel. She also produced a demon Asmodeus from her sexual liaisons with the angel Shamdan. 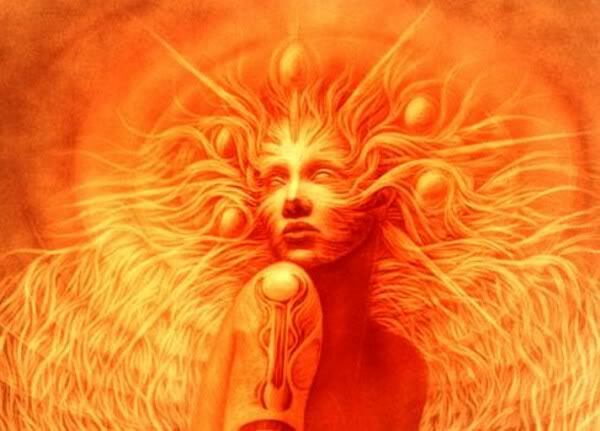 Namaah was simply living up to her lineage being descended from Cain, which after all was the son of the Devil, Samael, according to the Palestinian Targam, the Talmud and the Midrash. The Gospel of Philip and the Apocryphon of John make similar claims as well. First, she appears in the Hypostasis of the Archons, in which she is depicted as the virgin daughter of Eve and also plays a large role in Noah’s Flood. When Noah builds the ark, she attempts to board it, and when she is refused by Noah, she blows against the ark and destroys it with fire! When the wicked creator god, Ialdabaoth and his archons attempt to seduce her, as they attempted to seduce Eve, Norea cries out for help. Eleleth, one of the heavenly Illuminators, appears to her. Norea represent incorruptibility in this world, a being not created by the archons and a woman of heavenly origin. She defies the archons and calls to the God of the entirety to protect her from their advances. An angel comes down–Eleleth, sagacity–and begins to explain the allegory. A veil exists between the world above and the realms that are below; and shadow came into being beneath the veil; and that shadow became matter; and that shadow was projected apart. The Thought of Norea acts more like a liturgical prayer with Norea crying out to heaven and receiving aid from the “four heavenly helpers,” who are the Gnostic Illuminators sent from the Pleroma, which matches the Hypostasis of the Archons account. Both Irenaeus and Epiphanius mention Norea in the Ophite and Sethian accounts of creation in their long treatises against the heretics. Irenaeus calls Norea Seth’s sister and in Epiphanius, Norea is Seth’s wife. Dude! Baelish and Melsendre are Gnostic too. All the truly independent characters are! I think so too! Baelish is my personal favorite character on Game of Thrones.